Leave the chaos of the world behind ….. I am writing this because so many people have asked about their current symptoms, and especially those associated with the Ears. Many people have reported an increase in what the medical profession calls “tinnitus”, ringing sounds and buzzing sounds in the Ear or both ears. Then others have reported pain in the ears, and often that pain shifts down from the ears into the teeth and jaw, or up into the head where it becomes dizziness and headaches. This can be frightening, as these areas affect our daily functioning and our ability to maintain our balance on a daily basis. However, this process is part of the shift to a Multi-dimensional Energy Signature of Light Body. The Ear and the Inner Ear are situated between the 5th , 6th and 7th Chakras, or, in other words, that area of our Spiritual Anatomy that connects us to the Higher Dimensions. So, it follows that as we are realigned and rewired to connect more fully with our Solar and Galactic heritage, so we will feel changes and movements in this area. Archangel Michael guided me to look at an image of the Ear in order to explain what is happening to our bodies in this transformation. 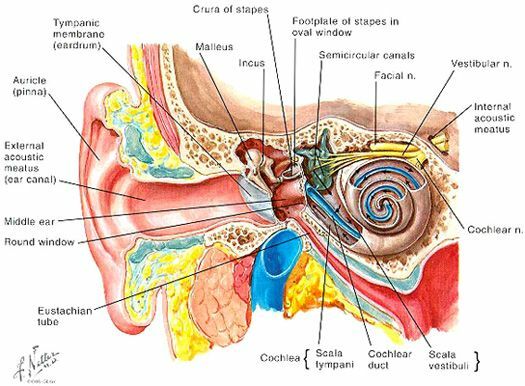 If you look at the Inner Ear, you will see an organ called the Cochlea, which is shaped like a spiral. This organ is responsible for translating sounds received into impulses that can be sent along the neural pathways to the brain and be heard and understood. But, on the Higher Dimensions, the Cochlea also acts as a Galactic “antenna” that can receive sounds/signals from the Higher Dimensions. There is a Cochlear spiral in each ear, and they work together to facilitate the function of hearing in the body. But, in spiritual terms, the Left Ear Cochlea works with the Left Brain to receive and ground information to do with life on Earth, while the Right Ear Cochlea receives and translates information from the Galactic level that connects to the spiritual and mystical realms. Both are connected into the nervous system and the brain. However, the impulses that activate the Cochlea spiral on the level of Higher Consciousness are transmitted via the Pituitary Gland and then into the Cochlea via various neural pathways and light meridians. This means that when Galactic Light Codes are being transmitted very strongly through Solar and Galactic radiation waves, then the Pineal is more strongly activated and likewise, in those who are ready, the Cochlea begins to vibrate with the messages of the Language of Light! In a balanced individual, the activation of Left and Right Cochlea spirals ensures that there is balance, both literal and emotional/mental and spiritual. In our planetary culture, we have been very “out of balance”, with the Left Brain being strongly activated and the Right Brain not. We live in a Left Brain society, where little importance is given to the activities and functions of the Right Brain, starting from School and continuing into Adult life. So it is that as the Right Brain Cochlea begins to vibrate in harmony with the Light Code transmissions of the Galactic spiral, you begin to “hear” transmissions that you did not hear before. This may simply sound like “white noise” at this time, as your brain has no idea how to translate it into meaningful “language”.But, as and when you begin to work with your Right Brain and expand into the Magical Higher Dimensions, these transmissions will begin to take on shape and meaning. You may begin to express the Language of Light through painting, music, poetry or any other right brain activity that you favor to express the flow of Galactic Light Codes. This is one of the reasons why so many people are feeling out of balance at the moment. The reliance on the Left Brain side is becoming so unbalanced that people are in danger of moving into the “shadow” energy of the Left Brain, in paranoia and psychosis and depression. So, many people may have no idea why they are suddenly feeling depressed, anxious, paranoid and maybe even psychotic. And because this is so widespread, even if you do not feel it yourself, you may feel it coming off other people in their interactions with you. Certainly, this is a challenging moment in our Transformation process. We simply need to recognize what is happening, and work to bring balance. Activate that Right Brain Cochlea with creative activity, with magic, art, dance and music. Dream and dance, paint and write, see the patterns and the magic in all things. Don’t get caught up in the shadow side of the Left Brain “downward spiral”. We all need the downward spiral to ground us in a healthy relationship with earth, but when it is unbalanced, then it becomes a pathology. I have to say also that I have found that eliminating dairy products from the diet can also help in this time if there is ear pain. Dairy products cause a build up of fluid in the ears, and if there is already pressure in that area, this can cause pain. And, when the Pineal is very active, that pain can be intense. So, dear friends, I guess this is the time to “listen up” and start hearing these new transmissions that are coming to us. I am working with painting, and the Language of Light transmissions are part of what I am doing now. Keep your balance, try to stay out of drama and paranoia, and spend as much time as you can in the Creative World of the Right Brain. Soon, our Planet will rediscover that Magic and Creativity are the Keys of Time, and that when we understand Time and how to work with Time, we will create a very different World on a very different Timeline. The Key is within us, as above so below. We have our own “Galactic Transmitter” that is now coming online! Leave the chaos of the world behind and prepare for the Golden Age of Gaia. Join me on this journey and maybe you will find something to inspire you on your own Inner Path to Wisdom. This entry was posted in Ascension. Bookmark the permalink. Enter your email address then click the button to receive notifications of new posts by email. You can manage your email subscription at the bottom of your email notifications..